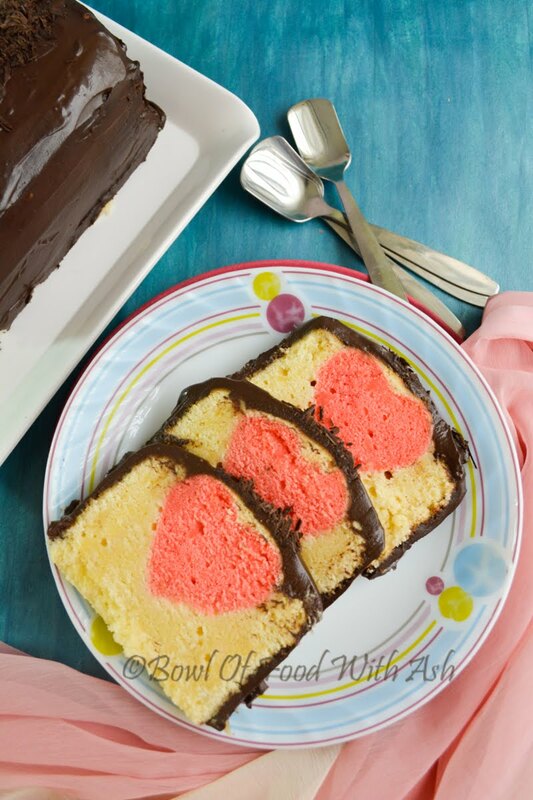 This is Basic Vanilla Pound Cake with Surprise Heart Shape inside. 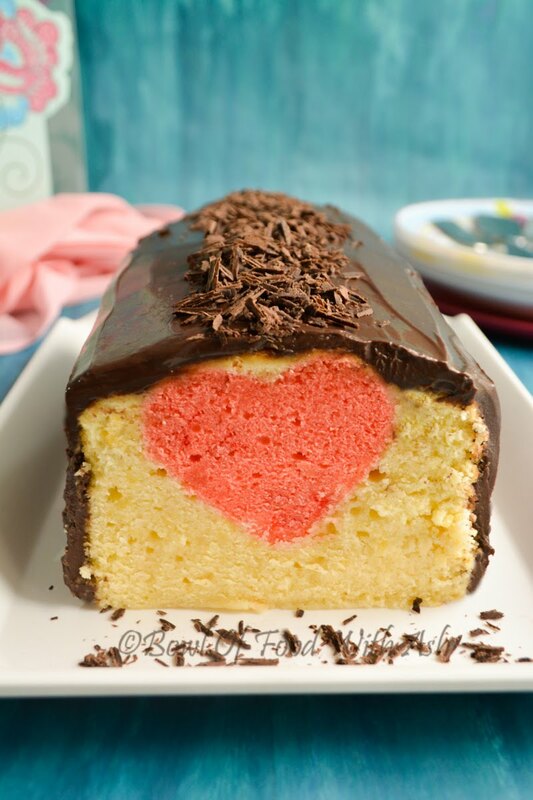 I always wanted to make this hidden shape cake ever since I saw one.But never dared to do it thinking it might fail. But this time wanted to make something special for someone special.. Thats my mom :).. I made this on my mom b'day.So this special cake goes to her. I must say making this cake is very easy. Only thing you need is little free time to bake the two cakes.But must say worth the time spent. I adapted cake from here. Go bake it and surprise your loved ones.. 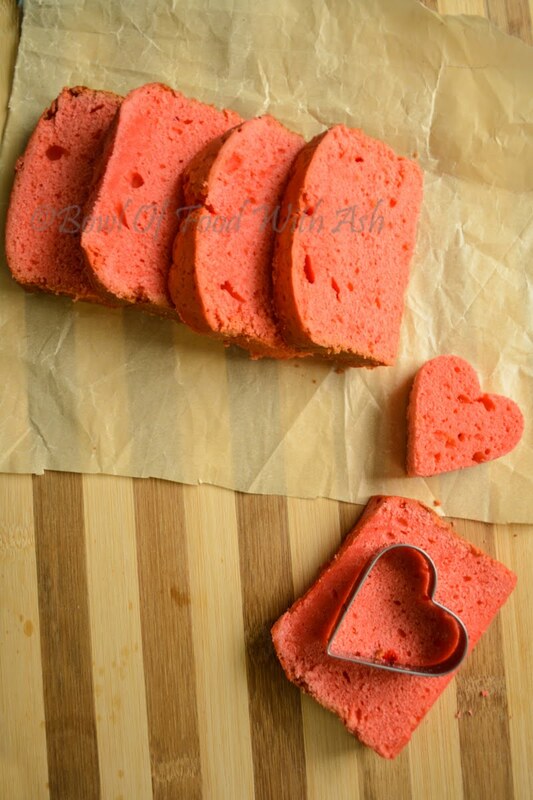 Simple Vanilla Pound Cake with Surprise Heart Shape inside. 1.Preheat the Microwave in convection mode at 180 degree for 10 minutes. 2.Grease the loaf pan and Line the bottom with parchment paper and keep ready. 3.In a bowl whisk together eggs, Vanilla Extract and Milk. 5.Now add the butter and half of the egg mixture and beat on low speed for 30 seconds. 6.Now Beat on medium speed for 1 minute to get fluffy mixture. 7.Scrape down the sides of bowl and add half of the the remianing egg mixture and beat for 30 seconds to get the fluffy batter. 8.Add the remaining egg mixture and food colour and beat for 30 seconds. 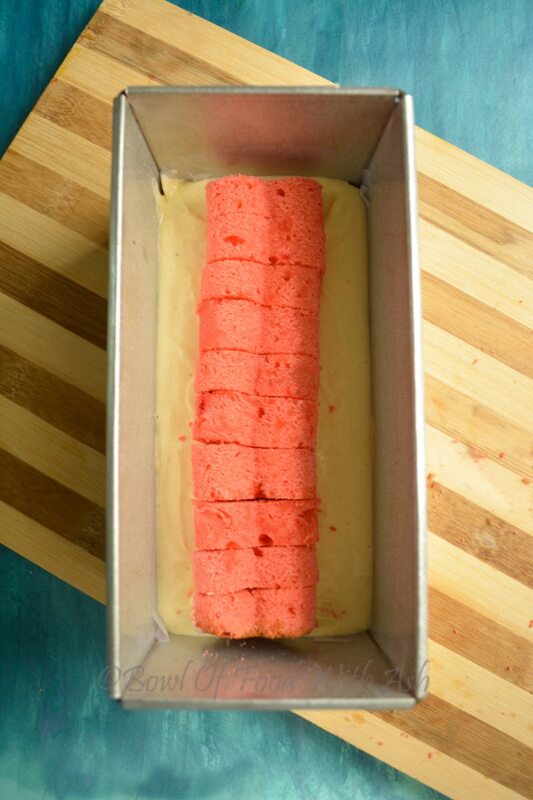 9.Pour the batter on greased loaf pan and tap gently to set the batter. 10.Bake the cake in preheated oven for 40-55 minutes till the toothpick inserted in the middle comes out clean. 11.Once the cake is cooled , cling wrap and keep in the refrigerator for minimnum 2 hours. Cookie Cutter should be smaller in height than the height of loaf pan. 14.Pour the 1/4th of batter to greased loaf pan. 15.Arrange the shaped slices next to each other tightly except walls. 16.Pour the remaining batter. tap gently and Bake the cake in preheated oven for 30-45 minutes till the toothpick inserted in the middle comes out clean. 17.Once cooled, Frost the cake with chocolate ganache or icing of your choice and slice it and enjoy. 1.Chop the Chocolate into pieces. Keep aside in a mixin gbowl. 2.Heat the cream in sauce pan in lower flame.Once bubble starts coming ,that is when cream starts just boiling switch off. 3.Pour the Cream over chocolate and whisk well to get the smooth ganache. 4.Refrigerate the Ganache for some time.. It will thicken. 5.Take out and beat for 1 to 2 Minute until ganache is fluffy to frost. 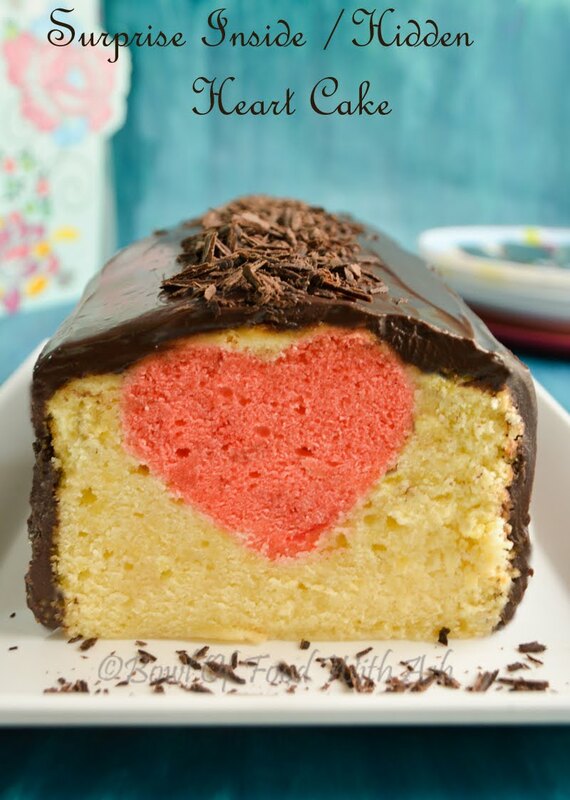 1.If you are making this cake with any other recipe, Please use only pound cake recipe. 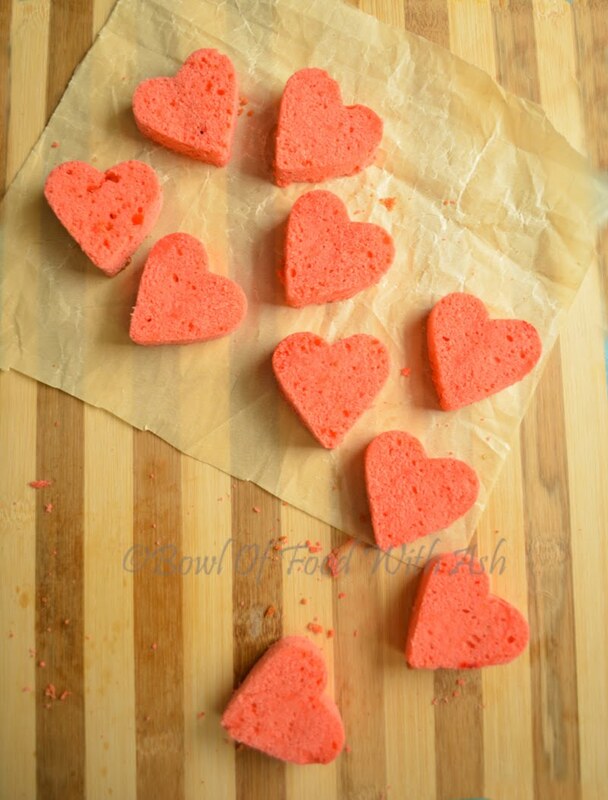 As the pound cake batter will be thick, it will keep the shaped(heart) cakes in place while baking 2nd time. 2.Baking time of 2nd cake will be lesser than baking time of first cake. lovely cake and thanks for showing the detailed step. Thanks shibani..Glad u liked it.Loved your space..